After the longer than usual entry – even for this site – for the top side of this record which had to cover a wide array of subjects and topics you’ll be glad to know that we can keep this review unusually brief. But far from merely doing so in an effort to off-set the time commitment a reader will have had to have made to get through all of Doby’s Boogie (well worth it though it hopefully was for everybody), the fact of the matter is there’s not much in the way of new components served up with this side to delve into. It’s another instrumental, meaning there are no lyrics to dissect. The same musicians play on it whose strengths and weaknesses overall have already been analyzed and are unlikely to change much here. Even the same trick of fading the record out which was something utterly unique when done the first time by Mitchell – since records in the 1940’s simply did not think of doing such things – and still noteworthy when done a second time by him, now is at risk for becoming old hat, or at least a trademark not really worth mentioning. So this will be a sprint rather than a marathon and perhaps the time it takes reading about the record will for once be no longer than the time it takes to listen to the music that record contains. 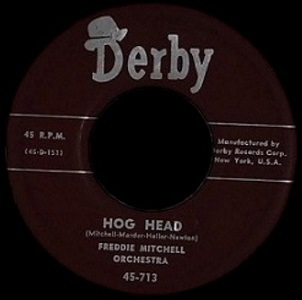 The noble tribute of the A-side of this record – in title anyway – has been replaced by something on the opposite end of the spectrum when it comes to presumed content on the B-side, a record called Hog Head. Now that’s not an altogether bad thing. For starters neither record had any lyrics so the titles are merely attention getters, something to ask for in a store or to scan a jukebox to find what number to press after depositing a nickel. If a radio disc jockey – and there weren’t many on the air playing rock ‘n’ roll in 1949 yet – was going to cue it up the title is what they’d use to identify it with. But beyond that it really didn’t matter what it was called. Certainly one of the reasons why interesting titles were dreamed up for instrumentals was to entice someone into giving it a chance. Those named after disc jockeys, far too many to mention already in rock’s brief history, were meant to get that DJ to play that record on the air which would allow it to be exposed to a listening audience who might then buy it themselves. 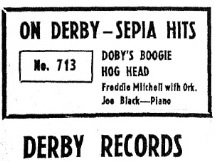 The record companies were also naming records in ways that would speak directly to the intended audience in ways they could relate to or find some meaningful connection with. Certainly that was the case with Doby’s Boogie, as it gave the African-American community a chance to celebrate the player who two summers ago had integrated the American League and by this point in 1949 had been named to his first (of seven) All-Star teams, further proving that black athletes could not only compete against whites but excel when given the opportunity. At other times companies were using certain staples of everyday black life to appeal to their audience, such as with food and drink as seen in Hal Singer’s Cornbread, Edgar Hayes Fat Mean ‘N’ Greens and Todd Rhodes Pot Likker, or with geographical symbols of vibrant black life such as Tiny Grimes’ Hot In Harlem or Joe Thomas’s recent Backstage At The Apollo. Most notable perhaps have been the concerted efforts to make sure the listener knew full well going in just what brand of music they could expect when laying down their money for records like Wild Bill Moore’s recent Rock And Roll or We’re Gonna Rock from the previous summer. (Did I include enough links for past reviews for you to go back and read? Since today’s review is much shorter than usual I figured you had plenty of time on your hands and needed something to do). Hog Head might conceivably fit some of those reasonings, there’s hog’s head cheese for instance and hogshead – written as one word – which refers to 64 gallons of beer, usually contained in a cask as opposed to a keg. Of course the hog’s head itself, as in the animal, is where you’ll find the ears, cheeks and jowls, all of which are not only edible but considered delicacies for many in the black community. So it may be that the name was chosen for one of those reasons, it probably was in fact, but which one we don’t know, nor do we particularly care. The other reason though, one which we DO care about, is simply that as a title of a rock instrumental Hog Head (minus the apostrophe “s”) just sounds suitably funky. If you needed a reason to give a song a chance that element will suffice as well as anything. Unfortunately the music they play when you actually listen to the record isn’t quite funky enough. Or funky at all for that matter. It starts off well enough with a rousing back and forth horn riff but then a strange thing happens… voices come in. That’s a good question and we’re not really sure of the answer. It’s probably the band members themselves, but the band didn’t have a female member and there’s definitely a woman’s voice in the mix. Not that any of them, male or female, are making any sense with their generic “Bah Ba Ba Ba Doh BA BAHHH” refrain (actually, each time through the primary male voice seems to change the consonants in some of the… ummm “words”… so feel free to hear whatever sounds you want in that part because it obviously doesn’t matter in the least to the meaning of the song). Now there’s certainly instances in quite a lot of rock songs over the years where nonsensical vocal chants are quite useful and invigorating. But this isn’t one of them. In fact it’s a huge let down because of the way they approach it. Remember, Mitchell was a veteran of larger jazz bands of the early 1940’s and ensemble vocals like this were fairly commonplace on plenty of bandstands. But not only is it not 1943 anymore, it’s not jazz they’re being called on to play, nor harmless pop sing-alongs. Rock requires something with more raunchiness, if not in the words they sing then at least in the manner with which they deliver them. Hog Head fails miserably on that account and when the horns come in after they’ve finished clearing out the room with their cheery plaintive cries of confusion the musicians are faced with a difficult task of stopping you from grabbing your hat and coat and heading out the door and down the street to somewhere far more appealing… like say the city dump or a used car lot. Mitchell may not get the tide of departing bodies to turn back in, but those who are stuck at the back end of the swarm heading for the exits might decide to at least stop pushing their way ahead and hang back a little, waiting until the crowd thins with the hope that Freddie and company might give them reason to stay for another drink. His stand alone spot begins at the 1:15 mark backed most notably by drums, which at least supply the requisite backbeat before the piano elbows its way forward in the arrangement. The fifty seconds he has to win you back over are indeed the best aspect of the record, playing a choppy riff with a repetitive simple melody that sticks in your head and keeps you reasonably interested. But there’s a difference between being just good enough to stop you from racing out the door and risking your life being trampled in a stampede brought about by that misbegotten intro and being something that is actually appealing enough to lure you INTO the club if you happened to wander by the open doors after the corpses from the mad rush to get outside and away from this scene have been packed into the hearses lining the streets. You may stop and try and make some sense of the carnage that had taken place, maybe ask a bystander or two a few questions, and while doing so found yourself reasonably swayed by Mitchell’s horn playing, at least enough to stick by the open door as the sounds waft out from the stage, but even so you’re hardly turning to your date and saying, “You wanna go inside and check it out?”. If you DID offer such a suggestion I’m reasonably sure that when the group horns come back in, conjuring up a jazzy New Orleans sort of feel – albeit without New Orleans caliber players – your date will turn to you with raised eyebrow and a quizzical half-grimace on her lips and say, “The vacant lot down the street looks intriguing… why don’t we go there instead!”. Not quite the endorsement Mitchell needs, is it? Sorry Freddie, Hog Head is another swing and miss on your part. It’ll take more than a snappy title to keep us interested in your output from now on. While there are still hints you have it in you to figure this out at some point and make a go of it, until you do there are far too many sax maniacs in rock ‘n’ roll who have no such problems knowing what buttons to push, the end result of which makes most of what you’re offering not worth the time or the trouble to give more than a passing glance to as we head down the block. 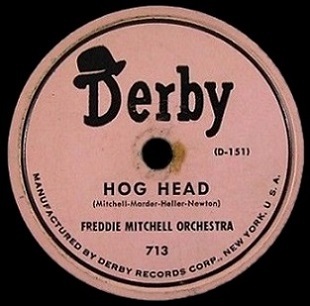 Leave a reply on "Freddie Mitchell: “Hog Head”"